Saturday- Today is our 28th wedding anniversary! I rode my bike today, instead of walking. We went to the coffee and doughnuts. Then Paula and I went over to Susan’s rig to do the baskets for the AOC rally. Susan and the Wagon Masters, Jim and Becky had decided to just do gift cards, so we changed from big baskets to gift bags. I sure hope we will win one! We sat talking as other ladies showed up, until around 11:30. I returned to the MH, we ate lunch. I also completed shortening all of the curtains. We now have a lot more light in the MH. At 5, we went to social hour, then we left and went to dinner at DaBoyz Pizza. 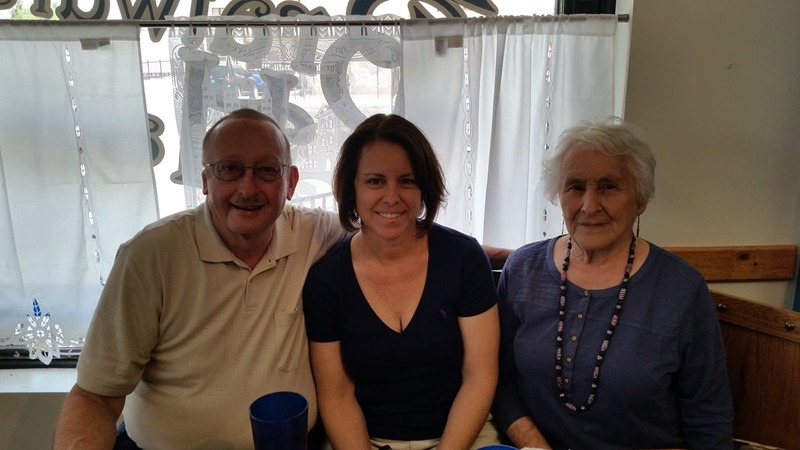 Paula had called for a reservation for 11, but John Kurtz decided not to go with us. 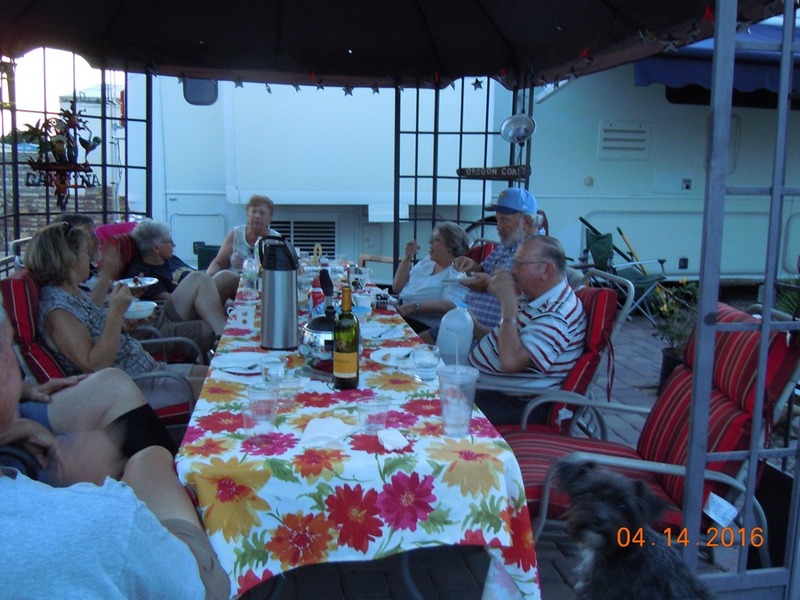 We had a nice dinner with Paula/Charlie, Alan/Donna, MaryAnne/Ray, and Marian/Marvin. It was a nice anniversary dinner. Sunday- We were up early as we were assisting with the pancake breakfast. It is pouring rain, and the resort could not move us this morning. So eventually, the breakfast was cancelled. I tried to organize a Mahjongg game, but could not get ahold of everyone. I worked on various projects and so did Bob. This is the last day of the Roadrunner Pre-rally. 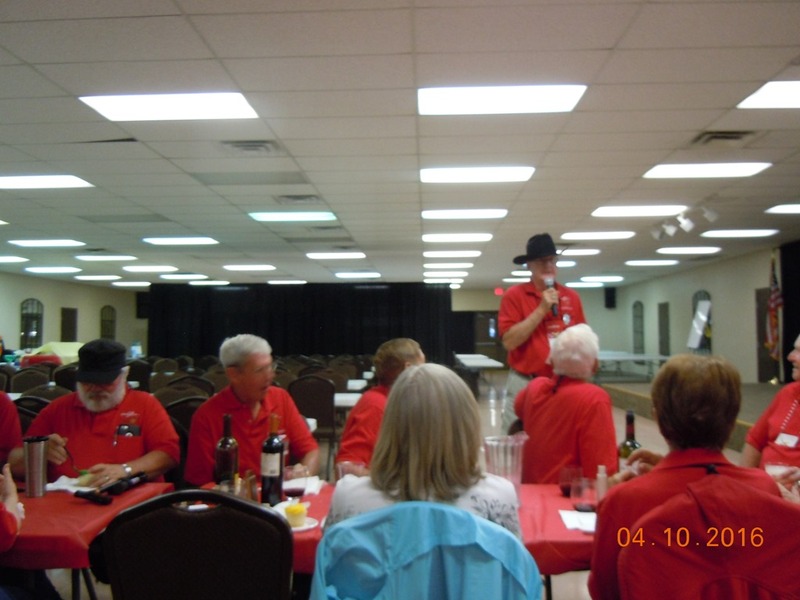 We had the Sheriffs dinner in the evening. The guy who was the Sheriff, did not do a great job. Oh well. Most people were not fined, but donated to the cause. 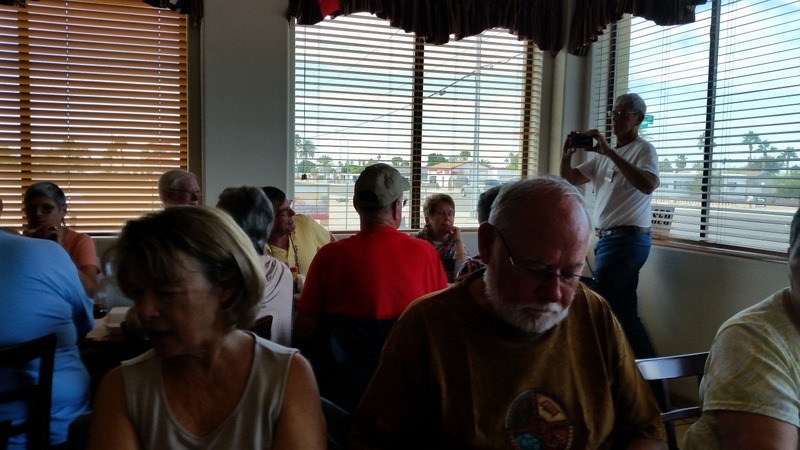 The money is going to local Area Agency on Aging The dinner was pork loin which was pretty good. .
Monday- We picked up MaryAnne and left to go to the Alfa Owners Yuma Monthly Breakfast at the Copper Miner Restaurant. We had a really nice time. There were a lot of people attending. We sat with Sven and Sharon, who are not attending the rally this year, Paula/Charlie and MaryAnne, Susan/ Dale. We knew a lot of people who attended. Mike and Lorraine Lynch drove in from Casa Grande to see everyone. That is Sharon and Sven in the picture, with Dale in the background taking a picture. MaryAnne returned to the park with Charlie and Paula. We left and went to a UPS store to have our South Dakota primary ballot applications notarized. We mailed them this morning. The primary is in June. 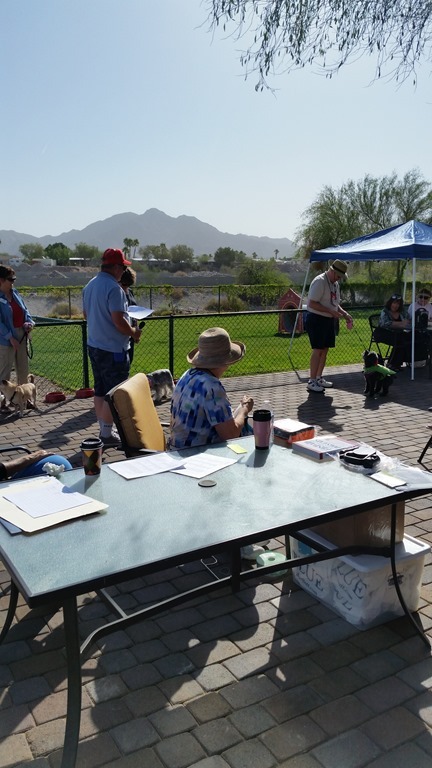 We returned to the park and went straight to the AOC (Alfa Owners Clubs) Rally registration. We registered and signed up for various activities. We are already signed up for some. We had a quiet afternoon. We went to happy hour at 4, then the Welcome Dinner at the main building. We had dried out chicken. which was so bad we could not eat it. The alternative was a lousy meatloaf, which had bell pepper in it. They mixed us up with seating so that people were not just sitting with their friends. 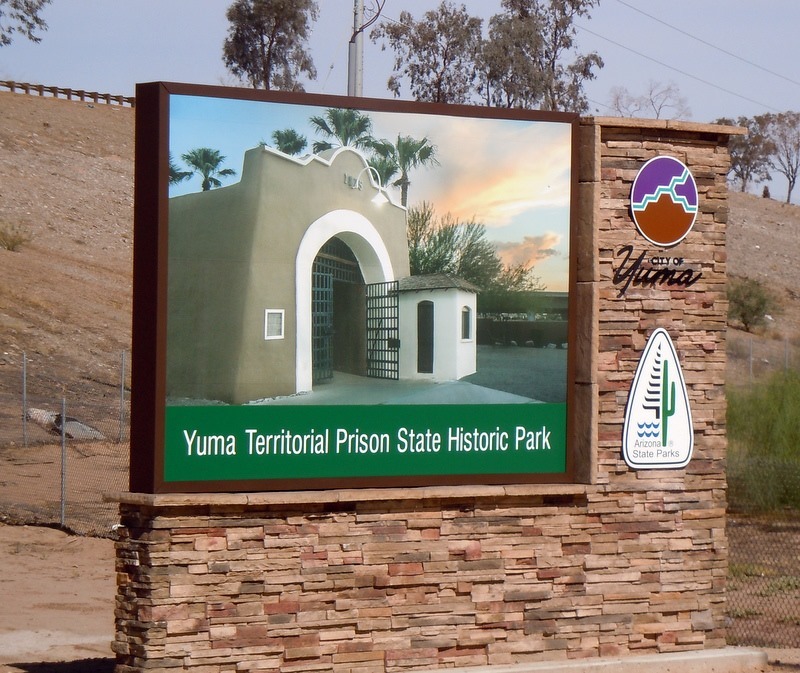 Tuesday- We were out early and on a bus heading to the Yuma Proving Grounds(YPG) at 7:45. The boarding was at about 7:50 and we started driving at 7:56. The bus was full. Randy Scott, who had organized this trip, had sent out an email about a month ago. There were 54 openings and over 100 people who wanted to attend. I immediately responded, as we had to give our drivers license numbers and dates of birth for a security check. It was first come first serve, so we made it on to the list. You snooze, you lose, many people who wanted to attend did not get on the list because they procrastinated. The bus took us about a 1/2 hour north on Hwy. 25 to the YPG facility. We stopped at the Museum to pick up the PR person. Her name was Terri Womack. The YPG covers 13,000 sq. miles, which is bigger than the state of Rhode Island, located between I- 8 and I-10. They also cover 20,000 sq. miles of restricted air space, with the air space going all the way up into space. There are no endangered species on the base and there is no urban encroachment. 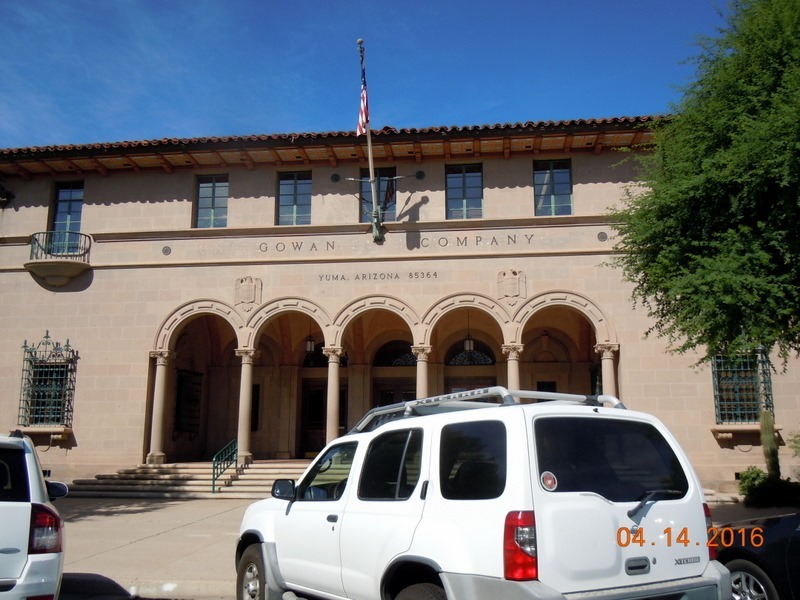 Needless to say it is a primary employer in the Yuma area and adds a great deal to the Yuma economy. On the tour, we were able to go to areas on the bus that if you just show up for a visit you cannot visit. 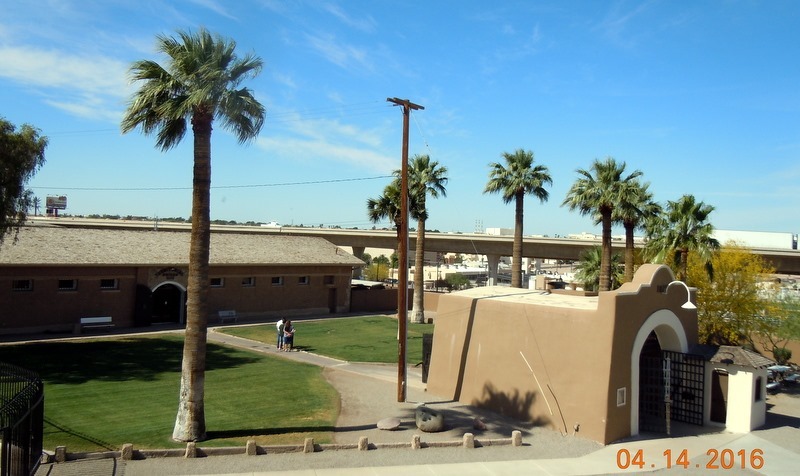 Our first stop was at a building where we were had a presentation on the history of Arizona, Yuma, and the base. It was very interesting, and was done by Terri’s boss. He was a little late because they had inspectors at the base today and were also doing some testing. That is Terri at the front, trying to kill time until the boss arrived. NASA does a lot of testing here and GM has a whole facility. When you see commercials about cars racing across the desert, they were done here on the GM course. When we left here, we were no longer allowed to take any more pictures until we returned to outside the security inside fenced area. The base tests various products including artillery, parachutes, tanks, and cars. They do air combat training and troop training. They developed GPS. Terri showed us a very large helicopter which was used for the first testing of GPS. The helicopter had so much GPS equipment in it, it only carried the pilot. I laughed, as I have a new Fitbit which has a GPS in it, right on my wrist! The bus took us to the parachute building which had a very high tower. In the tower they pulled up the larger chutes ( the heaviest load on a football field size parachute carried 30,000 lbs.!). The person used the tower to pull up the parachute and moves it slowly, shaking out the parachute. All sorts of things fall out, like snakes and scorpions! This day it was a woman who looked at the chute and put hot pink duct tape on areas, then went back and pulled that part of the chute over to a sewing machine and she proceeded to then sewed the tear. The parachutists pack their own parachutes. Chutes that have not been used for awhile are pulled back out and tested before use. There were thousands of chutes, waiting to be packed, in bins around the warehouse. We passed a new wind tunnel which had been recently built and went to an ammunition building. The guy who spoke to us showed us two different tanks, which we got up close and personal with! He also showed us some artillery pieces. We returned to the Cactus Café for lunch. We had a nice buffet lunch of meatloaf, mashed potatoes, corn mix, and salad. We left and went to the museum. We could take pictures again now. 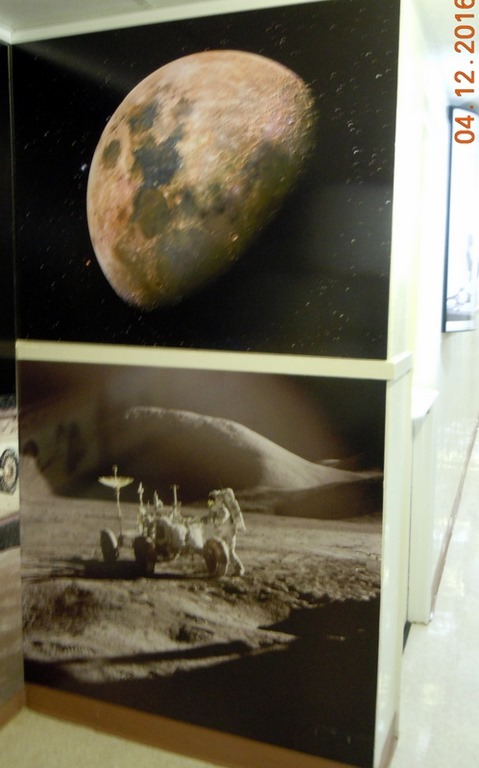 The museum had different exhibits. As Bob noted, there was nothing about the actual YPG, dated later than 1970’s. 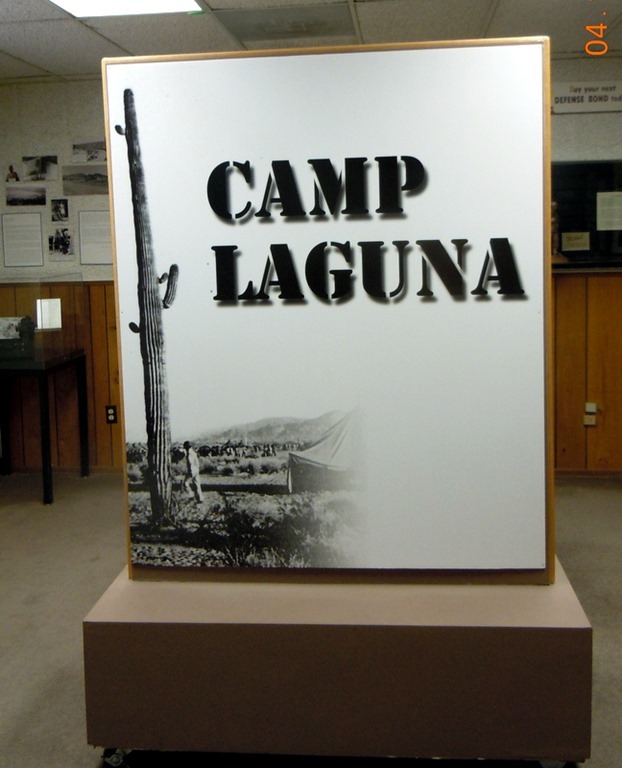 General Patton used the facility, then called Camp Laguna, as a training facility during WWII. They moved the troops into tents on dirt. 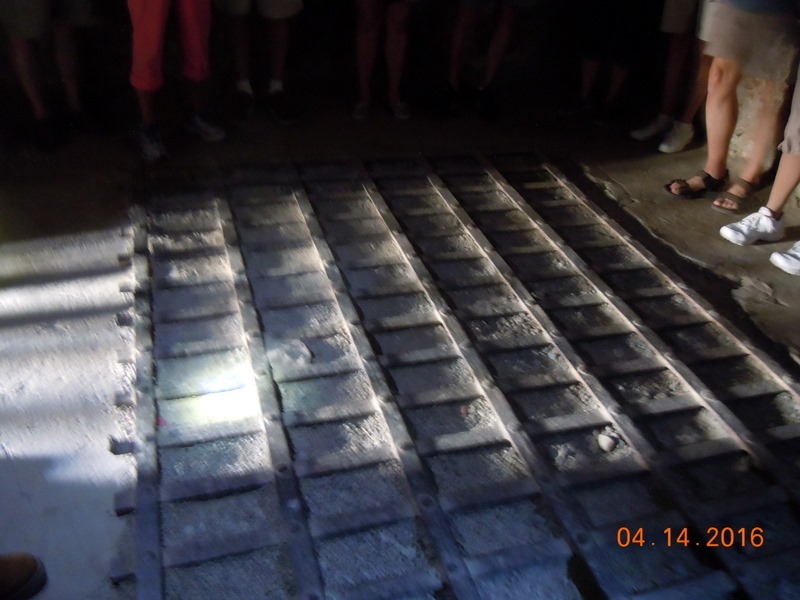 They put concrete in only for the cooking buildings. It was miserable. Here is a poem about Camp Laguna. It described the conditions graphically! There was a room dedicated to the Japanese surrender. 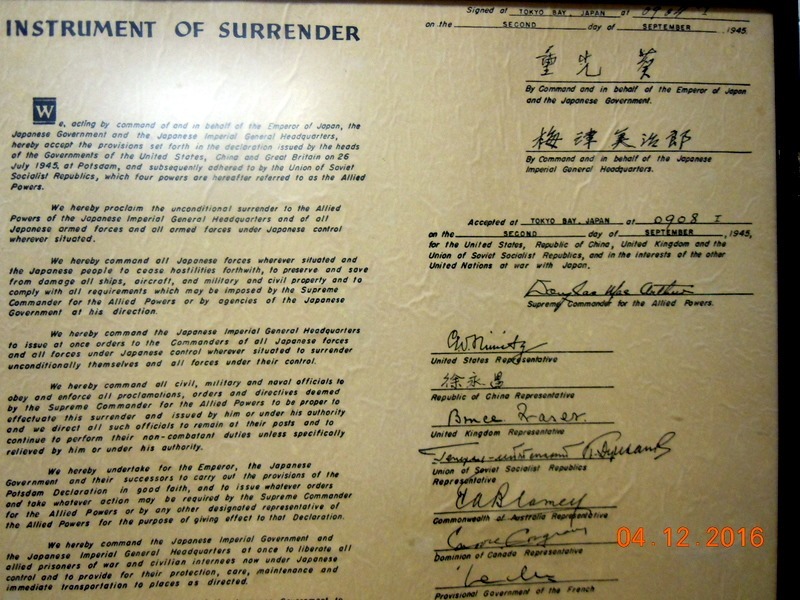 Here is a copy of the surrender document. 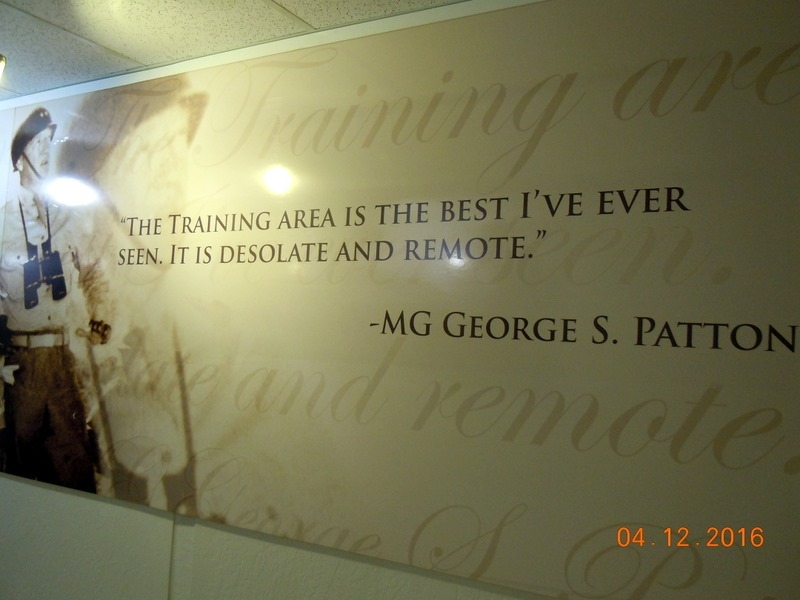 It was on the wall next to a TV which showed the surrender ceremony. General Nimitz signed for the US. There was an exhibit on them destroying bridges at YPG, which is one of their functions. 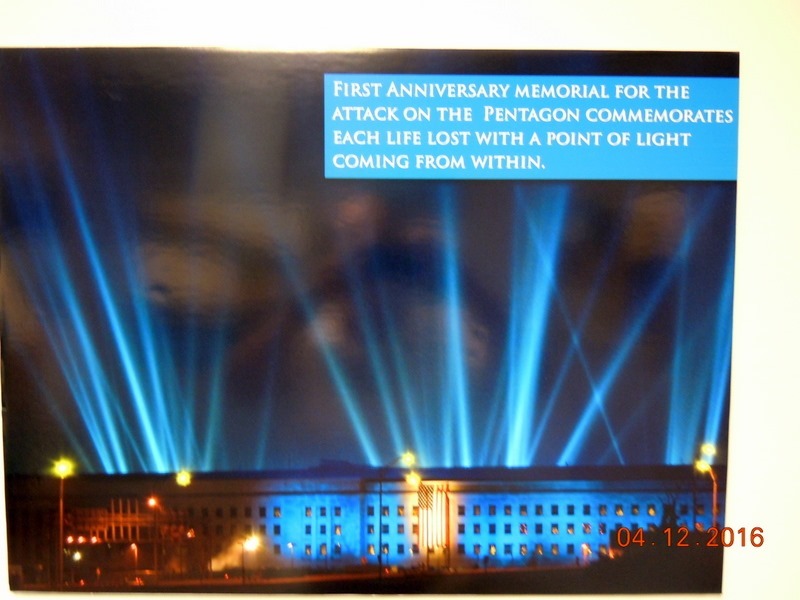 There was an exhibit on the Holocaust, with an emphasis on Dachau. Bob and I have visited Dachau, and we did not spend a lot of time in this exhibit because it is just too sad. There was information about NASA’s connection to YPG. There were rooms with old cameras and other equipment used at the facility, many years ago. 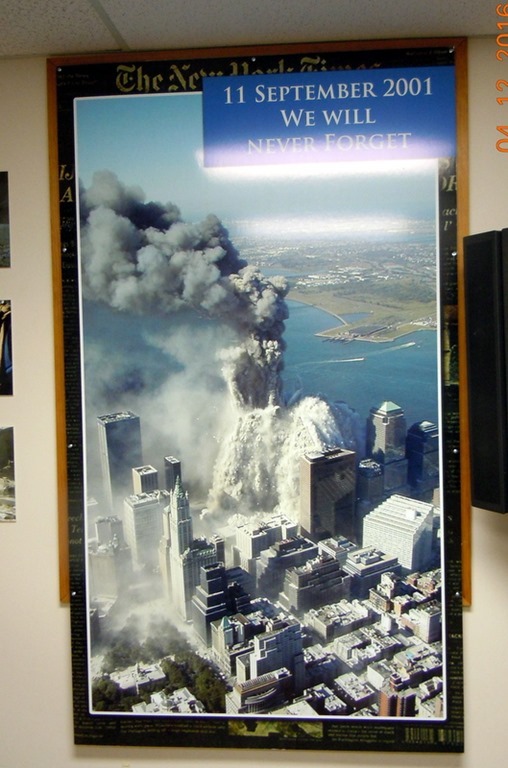 There was a 9/11 memorial room. 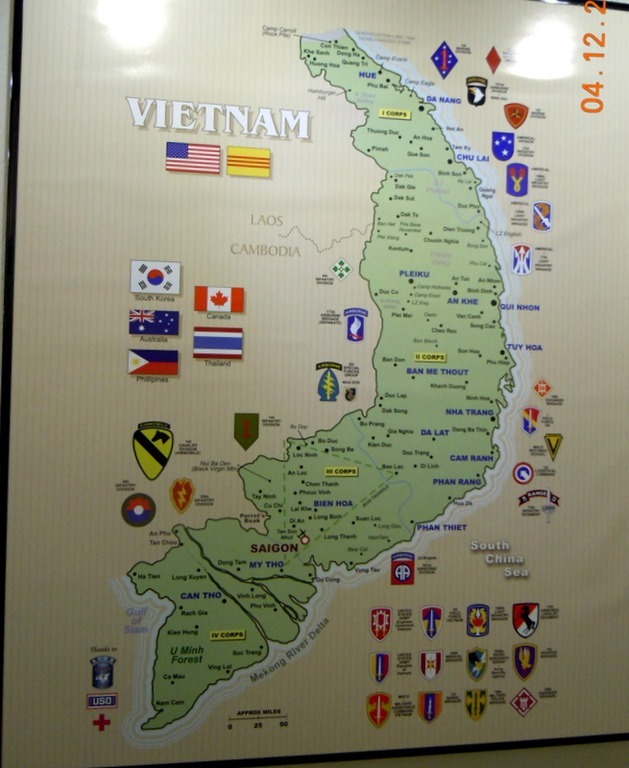 And there was an area dedicated to the Vietnam War. There are a lot of Vietnam Veterans with us. 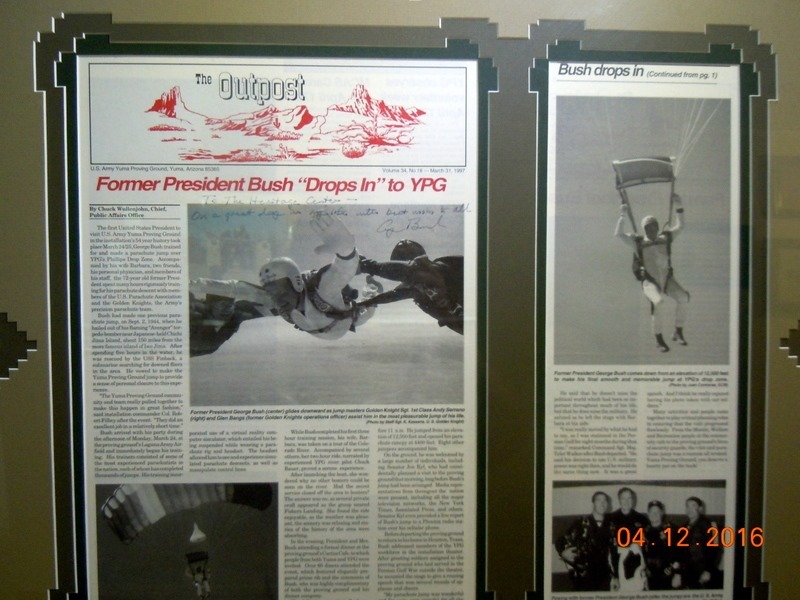 Finally, there was an exhibit about George HW Bush doing his birthday parachute jump, which he did at YPG. Also, there were exhibits of the offices of the old commanders of YPG, with rotary phones and President Eisenhower’s picture on the wall. We left and returned to the MH. We skipped social hour, as we were assisting with the pancake dinner. 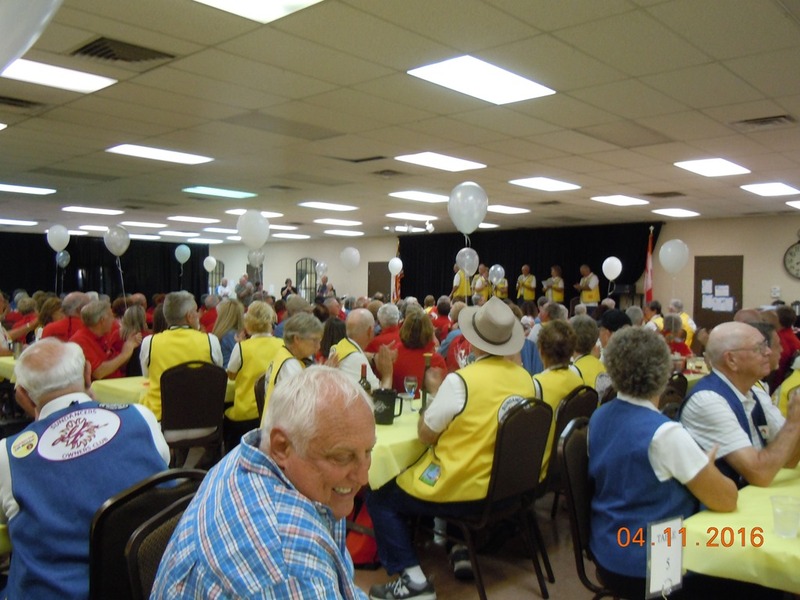 Since the breakfast was cancelled due to rain on Sunday, it was changed to a pancake dinner. We had food which needed to be used. Bob cooked pancakes, I made batter and assisted with set up. I also washed dishes. Oddly, we had an unfortunate incident. Donna had taken out plates and silverware, with our two bottles of water and set up places to eat. Some lady came along and moved them out of the way. Someone then drank both of our water bottles. When we finally, after everyone else was served, went to sit down, we had no water or silverware. Donna found the plates and one fork. They were at our original table. I had to go claim the other fork. Just as a man was drinking my water bottle, I asked if anyone had seen our water bottles. He hesitated but ignored me. We also found out that Paula and Charlie had tried to sit at that table and were turned away. This is very unusual behavior for folks in RV’ing. Usually, people are very polite and no one ever takes someone else’s stuff! We were all appalled! I was so mad I went and washed dishes! At least I was productive! Wednesday- We went to the coffee and doughnuts in the morning. We had to go early, as Joe from Auto Glass Boss was coming to replace our windshield and to fix the two windows in the big slide. He called and said he was doing another job first, and they arrived at about 9. They replaced both sides of the windshield, and while we were doing it, we had them replace the gasket. They repaired both the windows in the front and back of the large slide. The front one had the top pane falling down. Alfateers had caulked the heck out of it, but told us we needed a glass guy to fix it. The back one had shifted and the latch did not hold the bottom part up, so they fixed that also. They finished right when we needed to race over to the main building for the 40th Alfa Anniversary lunch. The lunch was terrible. The salmon was dried out, which is what I had ordered. It came with rice, green beans and a roll. I skipped the salmon and just ate the other stuff. Bob had the beef stroganoff, which was okay, but it had noodles, rice, greens beans and the roll also. Too many carbs. Both came with a salad also. 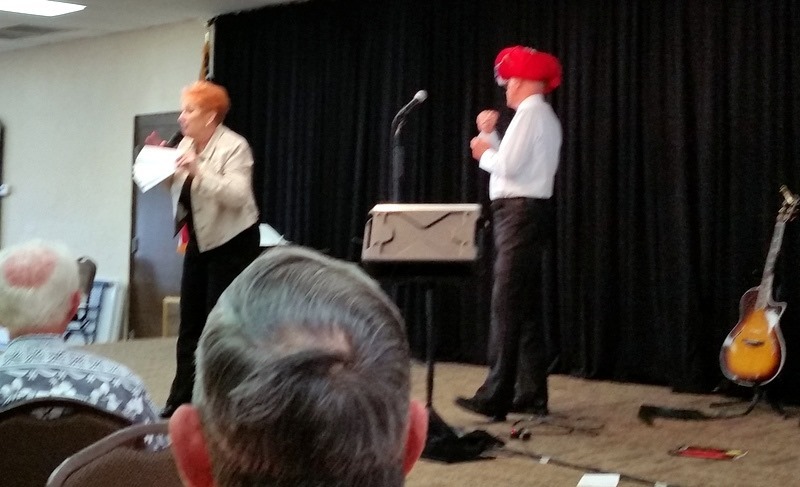 The entertainment was a couple named Bernie and Red. They are described at a mixture of Burns & Allen, The Smothers Brother and Bette Midler, with a touch of Carol Burnett and a dash of Benny Hill! Bernie was the straight man who sometimes let’s fly with his own one liners. Red is a zany red-head who holds center stage most of the time. They are both long time RV’ers, who were born in Liverpool England and immigrated to Canada years ago. They spent time entertaining on cruise ships until they decided that they wanted to do something different. They joked about RV’ing and living in a motor home. 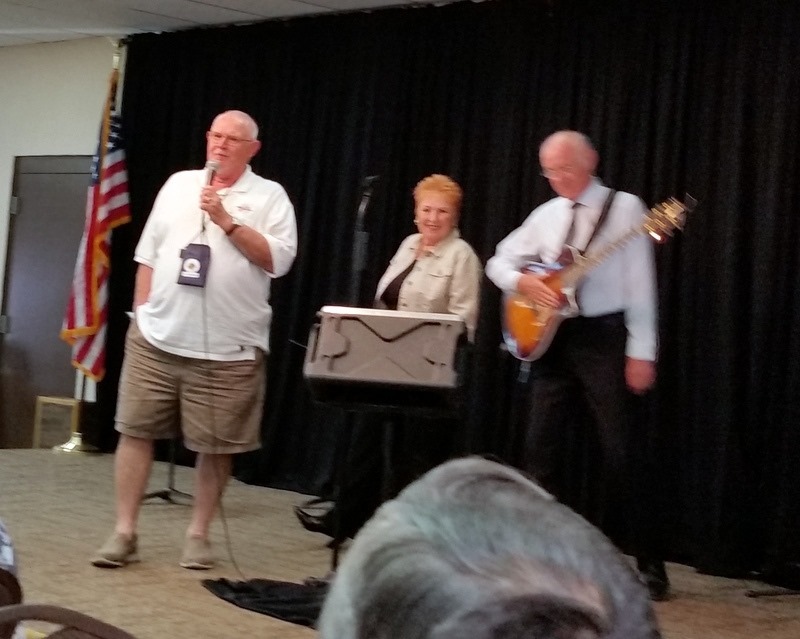 Both were excellent singers and Bernie played guitar and ukulele. In the picture below, they were doing a “Johnny Carson re-enactment”. We left after the show and returned to the MH. 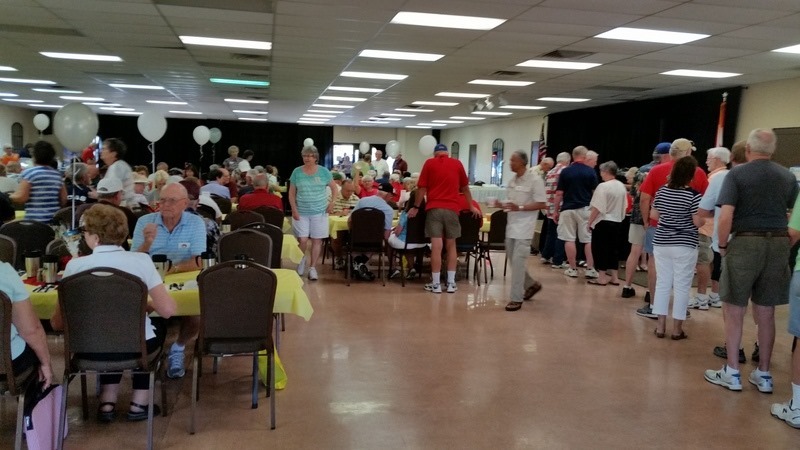 We went to social hour, then to the Alfateers evening BBQ. They cooked up hot dogs, hamburgers, potato salad, pasta salad, fruit salad and chips. We sat with Marian / Marvin, and a couple from Canada. Then we were joined after dinner by Paula/Charlie, Alan / Donna, Ray / MaryAnne. We discussed our trip on Saturday to Mexico. Thursday- Another busy day! 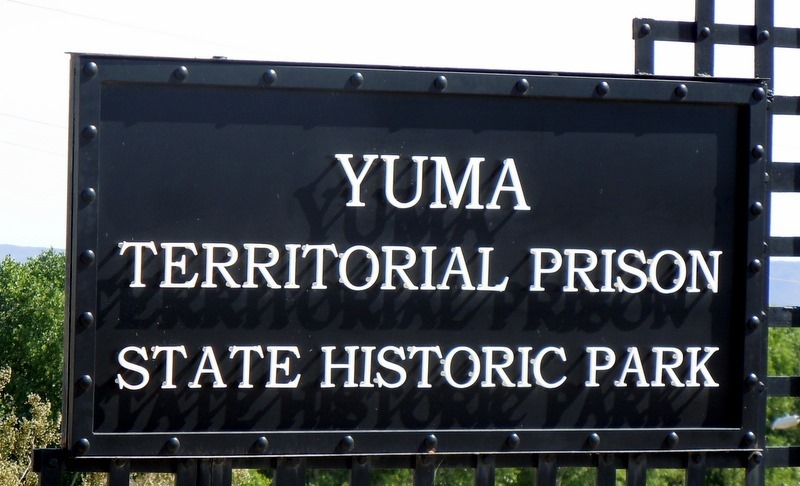 We left at 9:15, to run around Old Town Yuma on our way to the Yuma Territorial Prison. There are some cute shops in Old Town, but we did not stop. Above is an old engine sitting in the local park. 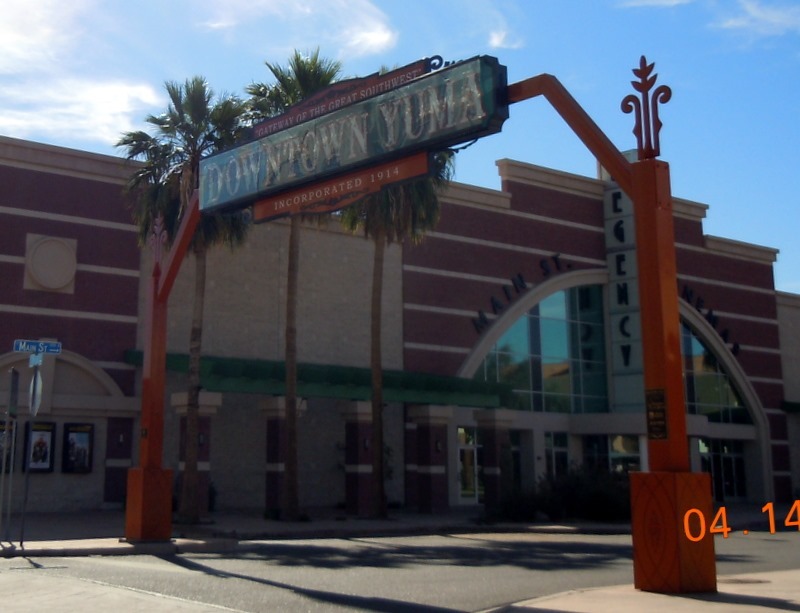 Below is the Old Town entrance. The Casino was actually a pool hall, never a real casino. Above is the replica of the guard tower. It has 32 steps to go up and there is a nice view from there. It was placed over the cistern. 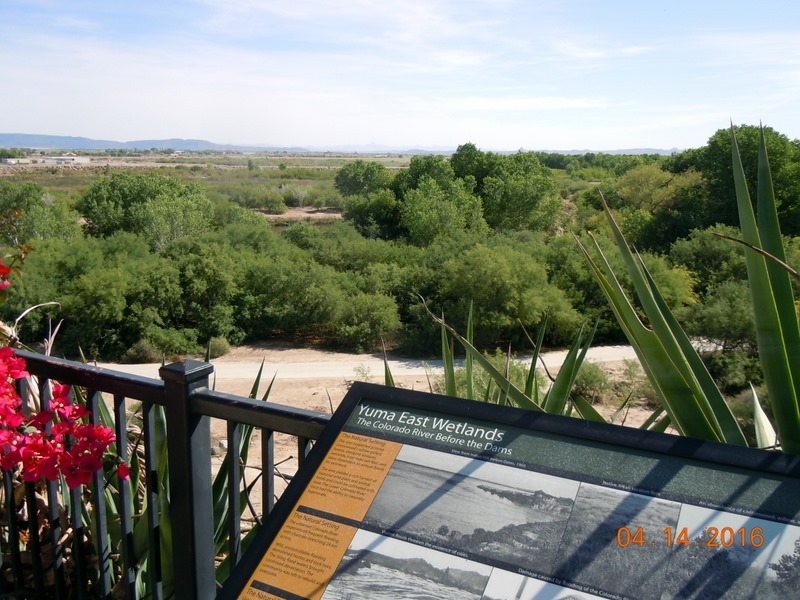 The prison was located at the confluence of the Gila and Colorado rivers. It made escaping difficult. To the west and north was the rivers, to the south was Mexico, and to the east was desert. Below is the prison entrance. Above is the entrance to the museum, which once housed the mess hall. 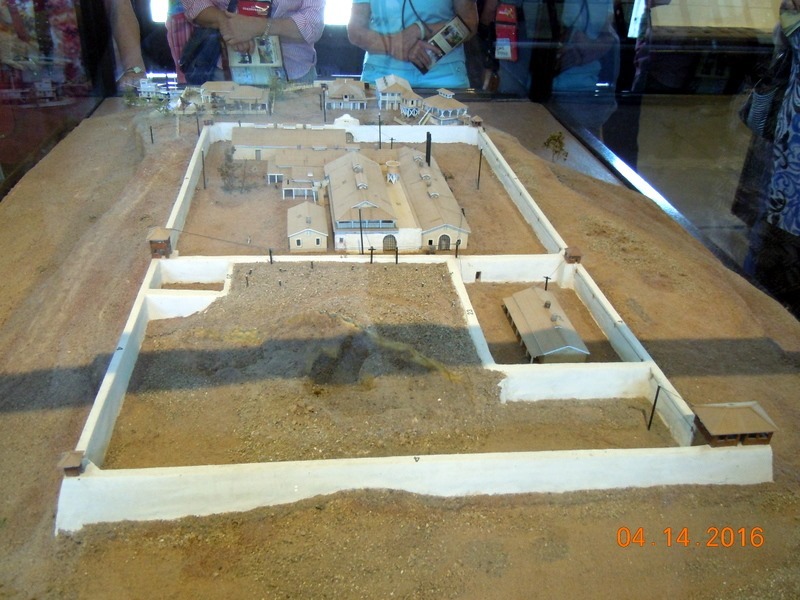 Above is a diorama of the prison. Above is one of the first two cells. These cells held 6 men. The top bunk is very high up. What you cannot see is the bucket. It was used during the night and was emptied in the morning. If it filled up, too bad, it just ran over. 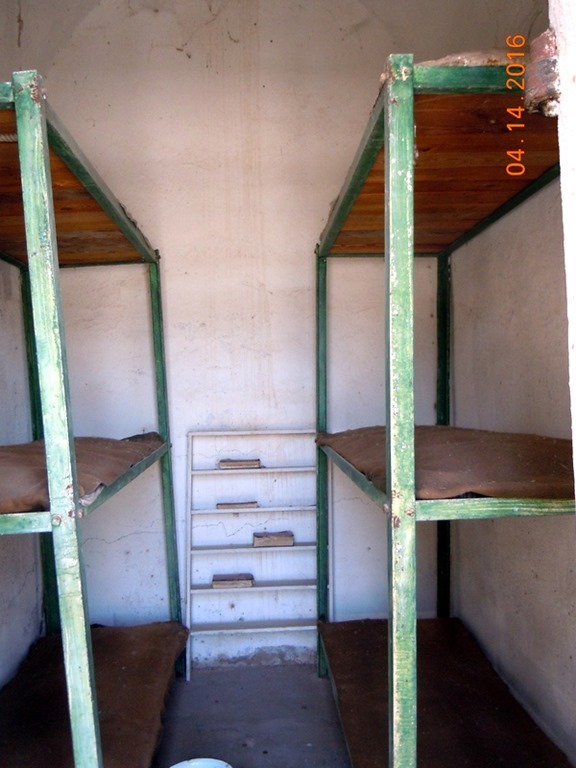 Note that the beds are made of wood. There were a lot of termites, which ate through the beds. Plus there were bed bugs, roaches etc. Not a pleasant place. Below is a more secure cell. It has a double door. 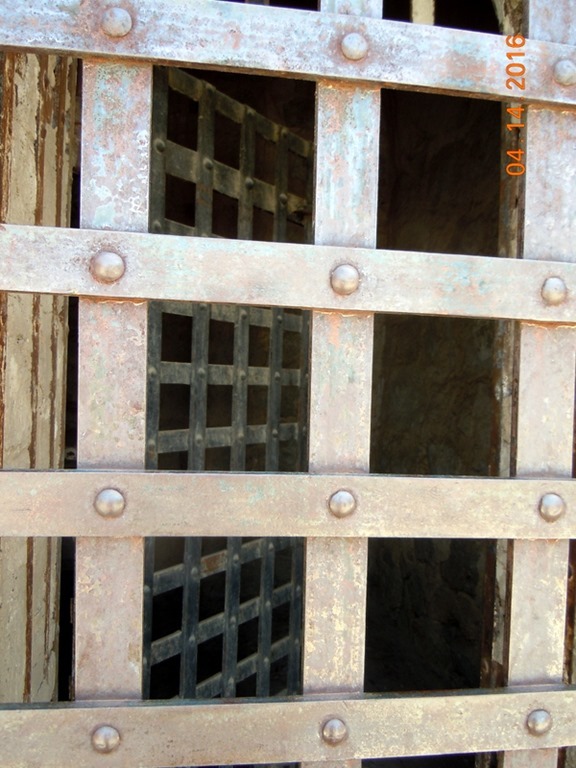 The doors open inwards to make it harder for the prisoners to attack the guards. 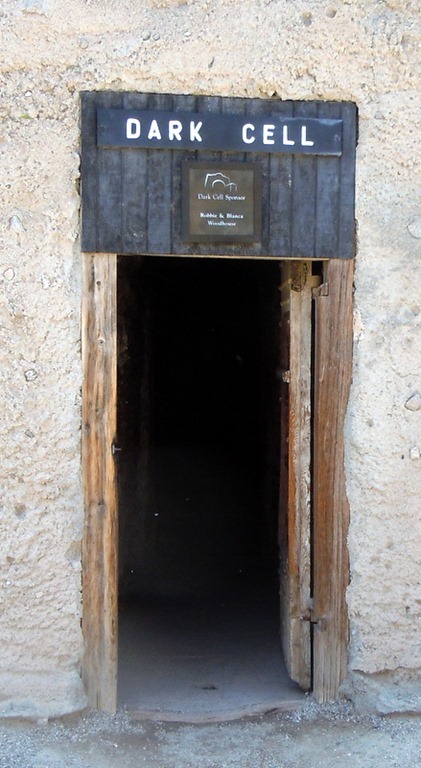 This door was designed to be held closed easily, so that the six men inside could not escape with the one guard holding the door closed. The dark cell was the punishment cell. You could be placed in there for any infraction. 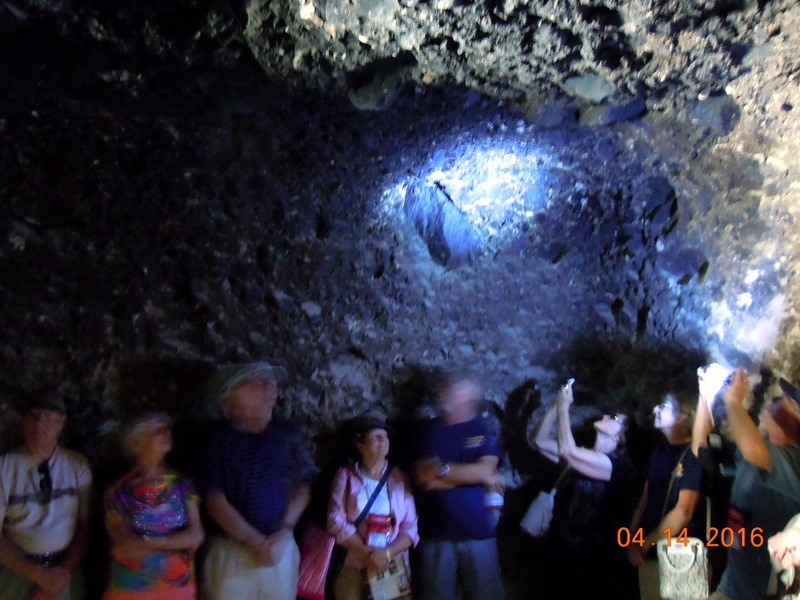 It is hard to see, but in the lighted area there is a bat. There was a hole in the ceiling and for fun, the guards would throw a scorpion or snake down the whole. Numerous convicts died in this cell. Above is the floor. There was nothing else in the room. One time a day the prisoners would be given bread and water. This is where they sat, ate, and did their business. Most prisoners never returned to this room, as they became model prisoners after a time in this cell. The locals called the prison The Colorado Country Club or “hell”, depending upon your point of view. 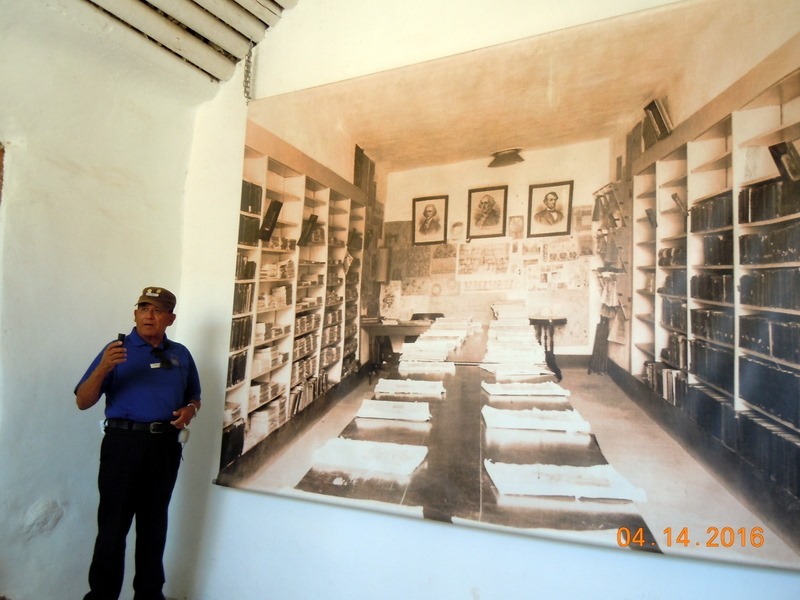 The prisoners had a library, medical and dental care, and education. They worked 48 hours per week, but had Saturday and Sunday off. The library was open to men from the town on Sundays for 25 cents. The money went to the purchase of books. One of the wives the warden came up with the library. If you could not read or write, in English or Spanish, you were taught. The people in town, who were the law abiding folks, did not have any of these amenities. The prisoners were taught a trade. They made money while in prison and the money was given to them when they were paroled, so that they had a start in a new life. Some of the people were there for things like adultery, or the Mormons for polygamy. 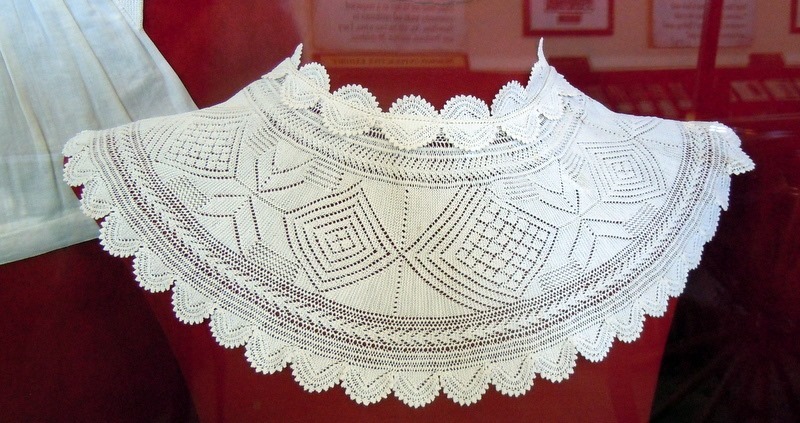 Here is a lace collar made by a prisoner who had cataracts! The prison had craft fairs where the towns people could come and purchase these types of items. The people with lesser crimes were in with murderers and rapists. No women were allowed in, until they started putting women prisoners ( 29 of them) in the prison. The first four were paroled just because they could not handle women at that time. There were 350 beds in the facility and there had been over 35,000 inmate before the prison closed. Dan, our guide, who was excellent, told us a lot of stories about individuals who were inmates. We returned to the park, ate lunch, and we went over to the hall to visit the vendors. We know most of them, but we had to have them sign a form that we visited their booths. The form was then dropped into a drawing for a prize on Saturday night. I attended another craft making. This time it was making a Christmas ornament. I had seen this ornament on Pinterest and wondered how it was made. I don’t need a Christmas ornament, but wanted to learn the technique. There were five of us signed up, but one lady went to Mexico and did not get back in time for the class. 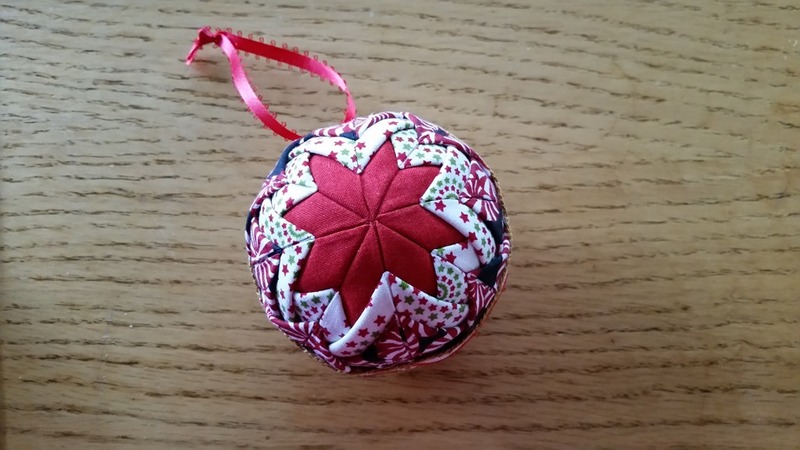 It is a non-sewing ornament. You fold 2×2 pieces of material. Bob dropped me off, and then went to the Post Office to mail a package. There was an ice cream social, and when I called Bob to pick me up he arrived in time to join me for an ice cream sandwich. 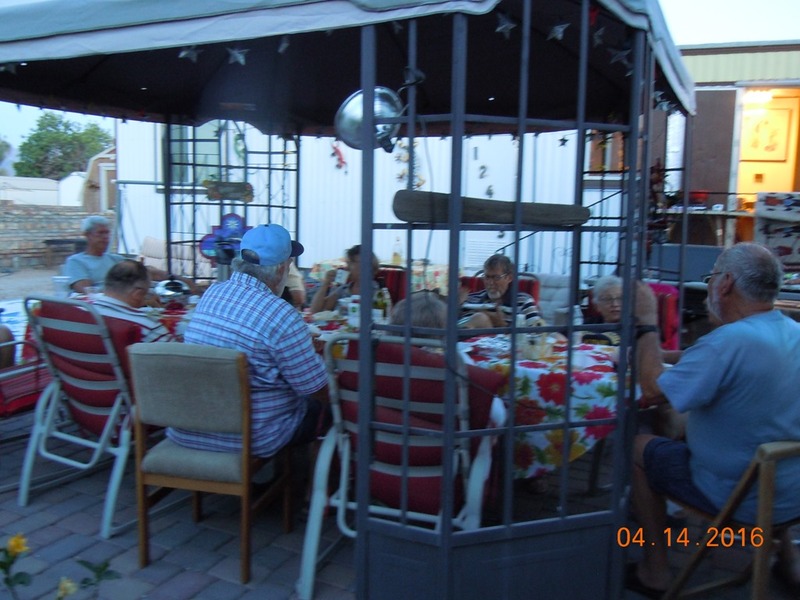 We were invited to Sharon and Sven’s home for dinner. There were 12 of us who went. We knew it would be good food, as Sven and Sharon love to cook! We took a fruit salad with us, MaryAnne took a green salad, and we had home made coconut shrimp with a mango salsa. Yummy; many thanks to Sven and Sharon for a great meal. The best dinner we have had since we have been here! Friday- At 8:30 we drove over to the dog run in the park. We took the dogs over with the other dogs, signed in, and waited for the Dog Show to start. There were three lines of chairs lined up to watch the show. Karlie in green and Roxie in the red. We had entered Karlie in the Tricks/Talent category. She is so well behaved. 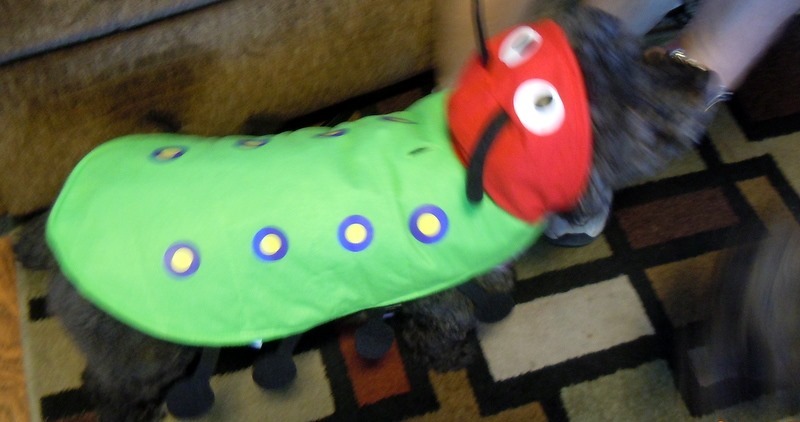 She did not win, as Harlie, a schnauzer wins every year. Harlie is a trained show dog, so he always wins the category. 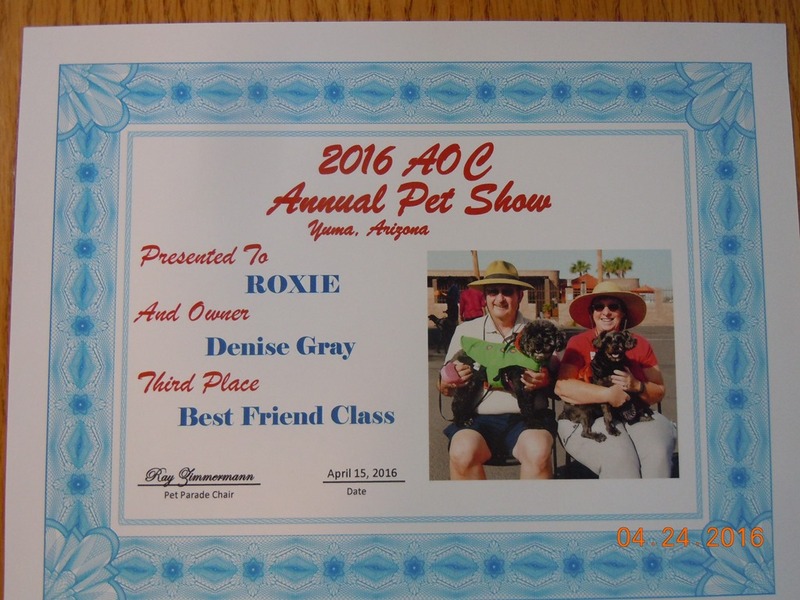 This year, he was not as obedient as usual, as he had ACL surgery and had difficulty laying down, but he still won first place. 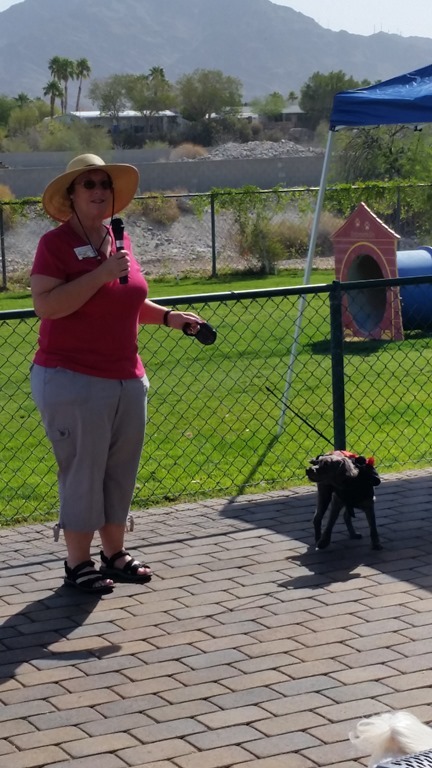 MaryAnne said that she heard the judges talking about how well behaved Karlie was, as she followed Bob’s commands perfectly. Still, she did not win. and tied for third place. I told the story of how she is Karlie’s best friend. It was so cute, as I go to walk off the ‘stage’ with her, Bob let Karlie lose and she walked over to Roxie and she escorted Roxie off the ‘stage’ shoulder to shoulder! We could not have planned that! We received a nice bag of goodies for each dog, including treats a, food, a ball, and poop bags. Once we finished, we let the dogs loose in the dog park. They ran around and around, enjoying the freedom. Once they were done with that, we returned to the MH. Ray stopped by and talked to Bob about our cabinet and about some fuse. At 11:10, we left to go to Das Bratwurst German Restaurant in Old Town Yuma, to meet up with Bob’s cousin Teresa and Aunt Betty. They are from Bob’s mothers side of the family. Bob had met his aunt as a child, but had never met Teresa. We had a nice lunch with them. They had the Rubens, Bob had a brat sandwich and I had a Schnitzel sandwich. All were very good. This is the last day that the restaurant was open for the season. They close for the hot summer. We left around 1 PM, and stopped at Walmart on the way back to the rig. The wind had picked up and there was so much flying dust, that we could not see the mountains in front or to the side of us! We shopped, then returned to the MH. I worked on the blog and Bob fell asleep in the recliner. Due to the wind, we did not go to social hour. We left at 5:30 to go over to the main building for our Chapter Dinner. We all of course wore our red shirts. One person per rig, drew a card, we had the King of Clubs. They then drew the matching card out of a basket. We won a $25 gift card to Walmart. Okay by us, we can use that!. We had already gotten a refund of about $25 dollars, and now the card, so we are doing okay! We ate dinner. The Wagon Master, Jim Godfrey had notified Bob and MaryAnne that their dinners had bell pepper in them and they were switched from the burritos to the chicken fried steak. I had the burrito which was edible, but that was all I could say for it. After dinner, we had the chapter meeting where they elected new officers. They also stated that there is going to be another rally next year in early April, details to be announced. 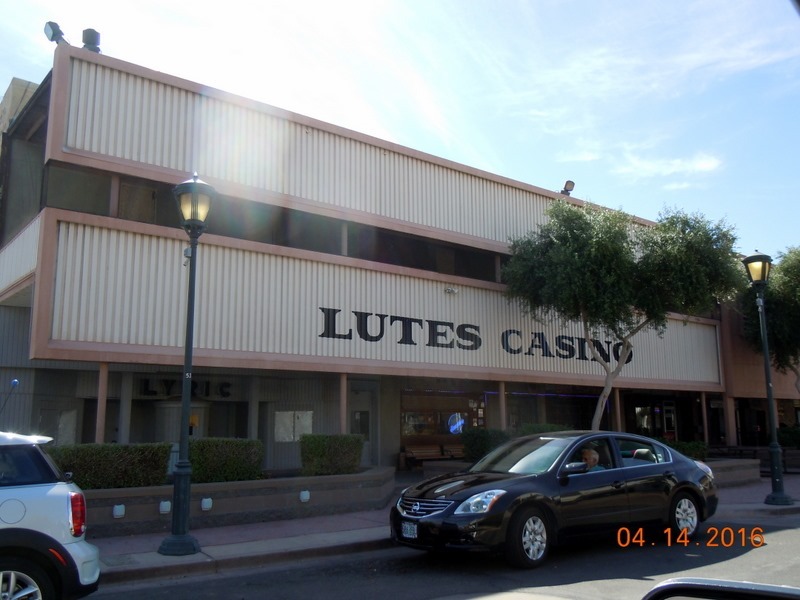 Although we know it is going to be in Tucson and starting April 1.